The Revolution Greens team went out for a bite to eat at a new spot today. 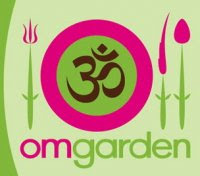 We hit up Om Garden in Downtown Miami. The food served at the restaurant is organic and vegan. A quick disclaimer no one our team is a vegan so dont click out of here yet. The place is a quaint with 14 seats and 7 spots at the bar. The kitchen is open so you can see you meal being prepared with all their quality ingredients. The menu has several options from sushi like rolls to pizza and has several smoothie offerings for all tastes. There is even a guilt free dessert menu. We each tried something different and we were all pleasantly surprised with our meals. Food tasted great and we felt great eating there. The restaurant is eco-friendly as well. It composts all of their fruit and vegetable scraps, uses 100% post-consumer recycled paper, provides their employees with eco-apparel made from 100% organic cotton, serves food in plastic-like containers made from 100% corn starch that decompose in landfills in only 50 days and uses eco-friendly cleaners to sanitize their store. They have several other green initiatives under way as well. If your interested in trying some great tasting healthy food, with a super friendly staff and helping the environment check out the website below. Cheers! It is the responsibility of the human beings to preserve our nature and environments. The logo here exactly reflects the purpose of this last minute assignment help. As the global warming is constantly increasing, we must read and share these type of blogs to aware about our present condition too.